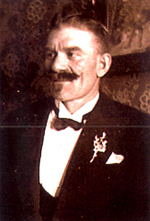 Pegel is a name synonymous with construction for over 135 years. 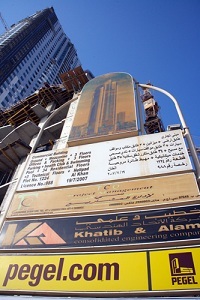 The company brings together an unparalleled combination of capabilities in building, civil engineering, multi-technical and maintenance services. With deep roots in its local markets in Germany and the Middle East, the company has held leading roles in major projects over the years. Today, by applying cutting-edge information technology coupled with a very high standard of employees, Pegel with its vast history of delivered German quality finished products makes it a one-of-a-kind construction company. Just after the German-French war when Germany was united for the first time, a huge construction boom emerged. Pegel participated extensively in this boom executing infrastructure projects such as railway stations, industrial projects, storage facilities, public facilities, administration offices and hospitals. After World War One, a period often called the "Golden Twenties" followed, during which the underground railway system or Metro was introduced in Germany’s Capital, Berlin, and the industrial sector developed around the car industry, technology and engineering. The fifties and the sixties saw the reconstruction of the war devastated country. The label "Made in Germany" became a brand name in itself, signifying world class leadership, based on outstanding technical features, high quality workmanship, sophistication and durability, all of which as a result of organizational skills coupled with committed reliable and precision-centered top-down individuals from Client to worker. Pegel had its fair share of projects during this period from 50's until 70's, especially in rebuilding Berlin. Pegel executed many demanding and challenging flagship and landmark projects such as the Berlin Tegel Airport and High-rise Buildings at the Ernst Reuter Place in Berlin. 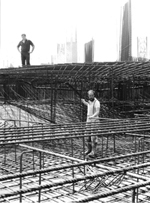 After that, Pegel exported its recognized expertise by participating in the construction boom of the 70’s and 80's in the Middle East, specifically in Saudi Arabia, United Arab Emirates and Oman. During this period, strong long-lasting relationships were forged with key players in the construction industry including Clients, both in the public and private sector, consultants, subcontractors, suppliers as well as a very large pool of construction industry individuals. 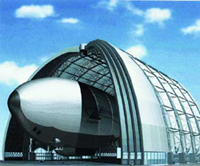 Prestigious large scale projects were executed such as the King Khalid International Airport in Riyadh. After the reunification of Germany in 1989, Berlin once again saw a huge construction boom as a result of regaining its capital status. Countless federal government projects were executed along with extensive infrastructure projects upgrading the former eastern part of the country. 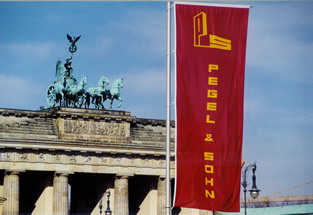 With pride, Pegel participated in full force executing projects such as the Akademie der Kuenste (Fine arts Academy) at the famous boulevard "Unter den Linden" next to the Brandenburg gate, the well-known Hotel Adlon, Cargo Lifter Hall, Rudolf Virchow University Hospital and the laboratories for the Humboldt university to name but a few. Today, once again, Pegel is participating in this decades largest construction boom in the world, namely in the United Arab Emirates where the world’s leading industry players are participating, where the most fascinating construction projects of the decade are being executed. Our philosophy is in line with our vision, and is more or less the road map to achieving it. The End User: Though most of the industry claims to have the Client as their focal point, Pegel elects to take it a step further, the Tenant. We believe that the tenant (End User) should be our focal point in any endeavour. We as Pegel have an unwavering commitment in delivering the end user with the quality that he deserves. Furthermore, though the phrase "House Hold Name" is usually reserved for appliances and products, we as Pegel, aspire to be a "House Hold name" for all potential tenants, home Clients and users that desire the quality we produce. The Client: Our commitment to our Clients goes beyond the services we provide, we believe in truly establishing a partnership with our Clients and treating their endeavors as our own. All requirements in terms of time and quality are considered sacred, while presenting our Clients with best practices in construction and value engineering, and produce the best alternatives for preserving their "value for money". The Employee: We strive to provide our employees with a calm and harmonious working environment where our people achieve their maximum potential. Each and every team member is continuously given a chance and hence truly feels that he/she can contribute towards the bigger picture as if it were their own company. The partner: Main Contractors, JV Partners and Subcontractor, are considered to be an integral part of our core process; a solid relationship is forged with all our partners on the basis of transparency, respect and rapport. We do believe that an interdependent relation needs to exist and develop with our partners, in order to meet the challenges of the current market. Technology: Although "Giving a man a Hammer doesn't make him a carpenter", however, giving a carpenter the right tool will make a huge difference! As Pegel, we do sincerely believe in good old fashioned engineering and industry best practices. Nevertheless, it is part of our core ideology, that employing the most advanced construction methodologies and applying cutting-edge information technology, coupled with hard-working talented industry experts who are technologically wired, will achieve unrivaled results. The society: We as Pegel, maintain a firm conviction in the importance of society and the surrounding environment. We have a solemn policy on Health, Safety and Environment, matched with the utmost respect and consciousness towards all neighboring entities. We firmly believe that all traditions and cultures should be respected and preserved. Our Vision, as Pegel, is to constantly raise the bar. We strive to go beyond "a Successful business" and to achieve a "Visionary Company" status. We are not "Time Tellers" we aim to be "Clock Builders", the Pegel name stood the test of time for the past 130 years, we will continue to do so for the next 130 years. Our Purpose, is to serve the end user at all levels. We go beyond the profit to serve our Client, and beyond the Client to serve the tenant. Our end product is a reflection of who we are. We are our People, a collective entity, our environment promotes dualism, where the individual is allowed to shine and self-actualize, while being an integral part of the collective. We are constantly challenged, developed and empowered. Our needs are always addressed and our welfare is paramount. Our Tools complete us, by harnessing the right technology, our goal is to be one of the most efficient construction companies. We aspire to have the highest information technology infiltration level in the industry and employ the latest construction methods and techniques. Our strategy is to become the company of choice for all involved; End users, Clients, Employees, Partners and Subcontractors. Adhering to the long history of German quality services, the entire Pegel team is continuously challenged to raise the bar by remaining up to date with the latest management information technologies and construction methodologies in order to always provide the best quality work in the most efficient manner. Such challenges trickle down through the entire organization. With a dynamic corporate culture based on genuine values, all Pegel's employees contribute to implementing the company policies with a strong commitment to quality and safety. Such commitments can only be achieved and maintained by instilling a clear set of values in order to create a solid and stimulating environment for better productivity and outstanding results. Teamwork: Our workforce is by far the most valuable asset we have. Providing the right environment is essential to attracting and motivating talents and promoting skills, hence forming a more reliable and capable team of individuals. We stimulate the minds and encourage creativity and innovation by constantly presenting new challenges. Although individual effort is required, we focus on teamwork because we believe that the key to success lies in a harmonious collaborative environment. Ethics: Honesty, integrity, respect and loyalty forge a relationship of trust with our Clients first and foremost, but more importantly among our employees. This is why we insist on bringing into our team individuals that have been raised, used and know nothing other than such ethical standards. Mutual respect: Different backgrounds and cultures generate a variety of views and concepts, hence contributing to the mechanism of innovation and fresh ideas. At Pegel, mutual respect is a must, allowing room for diversity. We learn from each other, thus enriching our corporation’s heritage. Quality and sustainability: Delivering Client satisfaction in terms of Client needs and adopted standards translates into quality. We provide that. Not only do we keep improving our performance based on previous experiences, but we also maintain a strong commitment to international standards because we want to live up to and exceed our Clients expectations. Following on from the history of German performance, these quality values have existed for generations, and will continue to hold true well into the future. This dedication to sustainability serves Pegel and serves our raison-d’être, the Client. Safety: The safety of our employees and of the environment we build in is the cornerstone of the relationship of trust we share with our Clients, suppliers and subcontractors. We strive to provide a safe and clean workplace with a minimum amount of risk by deploying professional technological and human efforts to prevent any possible incidents.